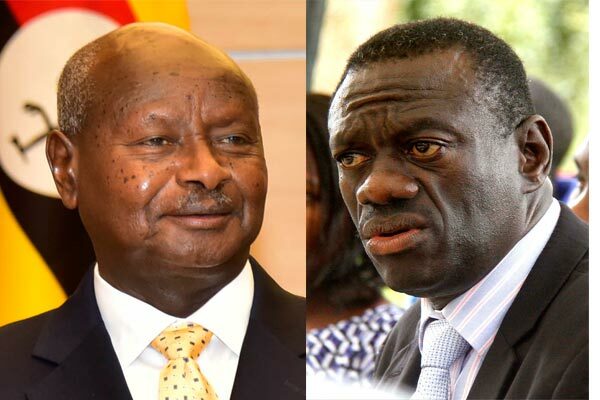 KAMPALA– Opposition lynchpin Rtd Col Dr Kizza Besigye has rebuked government for blocking Bobi Wine’s music concerts, saying the Kyadondo East MP has done nothing wrong other than speaking the truth. Speaking in Rukungiri District on Boxing Day, the four-time presidential candidate said that the government is scared of Bobi Wine for speaking the truth that is awakening Ugandans to understand the injustices under the current government. He was speaking during a thanksgiving ceremony organized by Rukungiri Municipality Member of Parliament Roland Mugume Kaginda at St. Peters’ Church of Uganda Kyamakanda archdeaconry in Buyanja Rukungiri district on Wednesday. “This is St Stephen’s day, we learnt about Stephen, when you are speaking the truth you know that you will be harassed, they will run against you, intimidate you forever, so for us they have been running against us all through,” he said. Dr Besigye’s remarks come after Bobi Wine’s Xmas concerts in Ggaba and Busabala beaches were blocked by police. At Busabala, police fired teargas and water cannons to disperse Bobi Wine’s supporters who had began gathering for the show. But Dr Besigye also said the struggle he and others in the country are on should never be tagged to political parties but a fight against injustice in the country that citizens can equally enjoy the country. The function was attended by MPs Mary Paula Turyahikayo (Rubabo MP), Fred Turyamuhweza (Rujumbura), James Kaberuka(Kinkiizi West) and businessman James Musinguzi Garuga. Kinkizi Anglican diocese Bishop Dan Zoreka said politicians should not fear speaking the truth for fear of being tagged to opposition as long as what they speak favors the people they represent. The service was led by the North Kigezi diocese Bishop Benon Magezi.